There's plenty Summer salmon that have now appeared in the Tay so there's a great chance of salmon action for those who can awake from their slumber and brush the cob webs off their fly rods! As an example I wonder what the yesterday's scoresheet would have looked like on the Tay if there was full fishing pressure and not only a few fishers here or there as clearly a big shoal of Summer salmon entered the Tay that weren't just destined for the River Isla! Isn't it a sad state of affairs for the Scottish rivers that all they have as a 'measuring tool' for stock is a 'half baked' and at best sporadic angling survey to advise on what salmon are present. As anglers & ghillies we are completely clueless as to the 'real' Scottish river salmon stock positions even though I'm 100% convinced they are grossly over estimated after hearing a Tweed official recently saying he had over 100,000 salmon entering his river annually. It's that kind of 'ostrich' behaviour coming from officials in positions of national trust that hinders progress as many people 'wrongly' believe that type of completely 'unsubstantiated' guesswork! While the powers that be flounder on with the management of this fine God given asset there's much still to be learned by the angling community about the game they are playing and how to become much more effective at catching salmon. During these transitional times for Scottish salmon stocks anglers are faced with 2 real choices from what I can see. The first one is to listen and believe the domesday brigade and Ebay off all your salmon fishing kit or use these times as a great opportunity for tactical salmon fishing skill development. There's never been guarantees given in this fine pursuit and I hope there never are as that'll take away the challenge and thrill of it all. 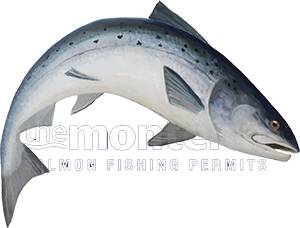 What I will say though is that over the decades I've been involved in this game I know a few 'salmon fishing specialists' that even if there was only one salmon lying in a pool they'd have the fly fishing skill ability to make it open its mouth! Scottish salmon fishing is magnificent from many different angles and salmon are true masters at 'escape & evasion' as that's exactly how they spend their entire lives avoiding capture & predation. I've personally seen salmon take a 'half moon' body shape wrapped around a boulder in a shallow pool while I've been wading past it in an attempt to hide itself from sight! Looking at any salmon pool where you're not seeing fish jumping about and assume there's nothing present is the biggest mistake of all that the vast majority of fishers make. 'The river's dead' or 'there's no fish about' have always been foolish words in Scottish salmon fishing that can 'infect' other angler's thoughts and efforts along with filtering down onto social media, websites and even TV! Regardless of the seriously flawed and inconsistent catch returns 'measuring tool' there will always be salmon present in the Scottish rivers to be caught if the pools are approached with enough due care and attention. This is a great time for salmon fishers to improve their 'sub surface' fly presentation thoughts, riverbank stealth tactics and effective hooking skills to ensure they still keep connecting with the occasional salmon. This is the time for salmon fishers to learn the fishing skills that'll bring them up to the next level of riverbank effectiveness & efficiency. Firstly you need to learn how to fully load your fly rod and why optimal loading and long range salmon 'fly control' will massively increase your daily salmon pool water coverage. Then understand and pay complete attention as to how you're spacing each swing of the fly to tempt that reactionary impulse from a fish that's not feeding in the river instead of trying to bore the fish to death! Those 2 basic points are only for starters before you get into the psychology of the fly pattern and how to visually measure the depth of the pool and select the correct and long enough sink tip paired with the correct tactical mend to get that fly right down onto a salmon's nose when they're playing hard to get to force a take! There's really so much more to this business than the majority of salmon fisher can imagine if results are to be achieved and what a great time to brush up!